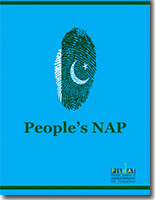 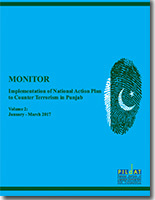 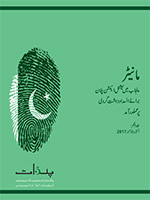 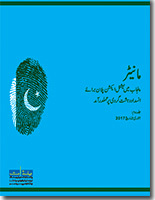 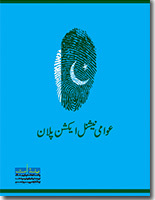 This is Urdu version of " Monitor on Implementation of National Action Plan to Counter Terrorism in Punjab, Volume 4"
This is Urdu version of " Monitor on Implementation of National Action Plan to Counter Terrorism in Punjab, Volume 3"
This is Urdu version of "Implementation and Monitoring of the National Action Plan, Volume 2"
This is Urdu version of "People's NAP". 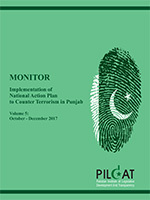 Developing and advocating for reforms in rule of law and the uniform application of rule of law in Pakistan have been the guiding principles behind all of PILDAT’s initiatives. With building capacities of legislators to effectively oversee governments to developing legislative briefs on key laws to facilitate informed legal decision-making; proposing reforms for FATA to democratic oversight of defence and national security; developing proposals for reforming Pakistan’s Police system to improving prosecution services; advocating for free legal aid to developing comparative provincial rule of law index, PILDAT has worked across the national spectrum on a number of areas under the overall umbrella of rule of law reforms. 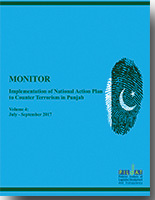 PILDAT also facilitated the formation of a Multi-Party Parliamentary Caucus on Rule of Law to develop rule of law reform proposals and lead advocacy for reforms nationally.